As a lover of berries, I wholeheartedly endorse eating them as God and nature intended: straight off the bush… or out of your grocer’s green quart container. 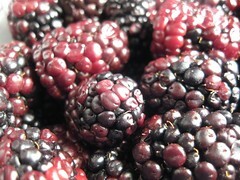 And I’m a true believer: I regularly gorge myself on whole cartons of berries — and cherries, now in season! — minutes after they enter my house. Blueberry-purple tongue? No problem. Strawberry seeds in my teeth? Who cares? Cherry juice stains on my blouse? My drycleaner loves ’em. But, sadly, sometimes a berry-buying frenzy can result in berry casualties. That’s right: You see all those gorgeous gems stacked into sparkling pyramids in the produce department, and you can’t help yourself… you overbuy. 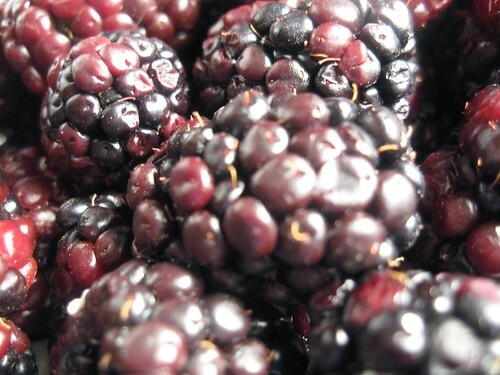 Some berries get shoved to the back of the fridge, forgotten. Perhaps some go uneaten when you leave town for a few days. Or perhaps some were just slightly too ripe when purchased. 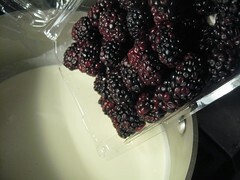 In any case, sometimes berries go past their prime — and, shockingly, sadly, are no longer fit to consume unadulterated. That’s where my husband’s ice cream machine comes in. 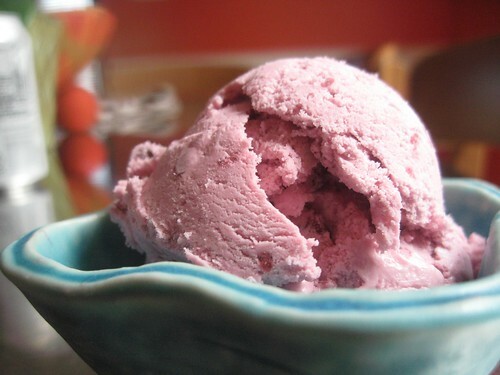 Ice cream is the perfect resting place for berries otherwise destined for the boneyard. Softened by time and ready to relinquish their luscious juices, overripe berries partner perfectly with a little cream, sugar and cold freezer air. Sure, they’re no longer as sweet or sunkissed as they once were. Yes, they have undesireable blemishes and their skin gives a little too easily. But none of these things matter when they come into contact with blissfully sweet cream. Yes, friends, you can ressurect those past-their-prime berries. Don’t toss them into the garbage… toss them into ice cream, man. 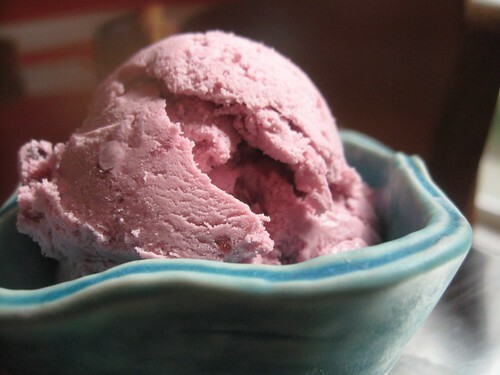 Click here to download the recipe for Blackberry Ice Cream. First, the kitchen can be closed. Things are fresh. 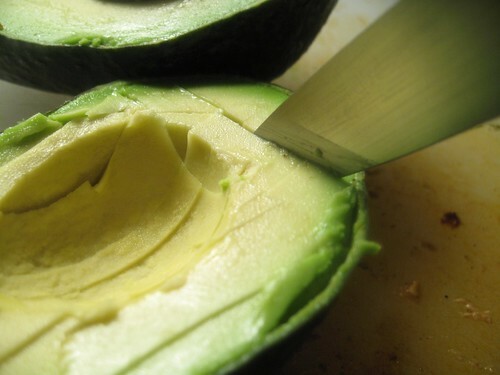 You can create a lot of delicious dishes with just a knife and a bowl. Furthermore, you can cook outdoors — bringing in those incalculable benefits of charring and burning things over flames. Second, everything is in season. 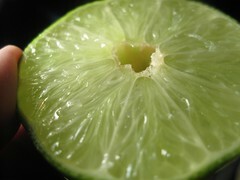 Most fruits tend to be fresh and local for a brief period. The number and colors of ingredients explode. Pretty much everything tastes better for the next 20 or so weeks until the last of the apples start to make their way off the trees. This recipe is an homage to one of those ingredients that is starting its brief but vibrant trip into freshness — the blackberry. While I’d recommend you eat as many of these while you can, this is a great use for those that you start to see go wrong before you can get them out fresh. Also, feel free to substitute the frozen variety. Finally, I feel the best part of this recipe is that it is a combination of flavors I really enjoy. It is sweet, tart, tangy and smooth. It has a refreshing character that makes it great for an evening summer meal — and there are a number of those ahead. 1. Add the yolks and sugar to a medium-size bowl. Whisk together and then set aside. 2. 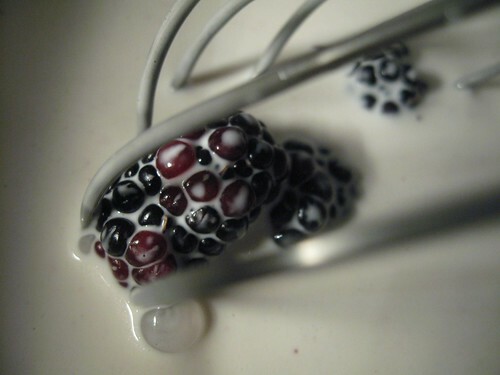 Using a double boiler — or, less ideally, a medium-size pot — over medium-low heat, add the milk, cream, blackberries and salt. Regularly whisk the mixture, heating until the temperature reaches approximately 145F. 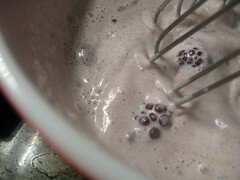 The mixture should begin to turn purple. 3. Once the cream mixture has reached the desired temperature, slowly add about half of the mixture to the eggs and sugar while whisking vigorously. This will prevent the eggs from curdling. Once the eggs and cream have been thoroughly integrated, pour back the egg mix into the remaining cream. 4. Whisk constantly and slowly as the mix rises in temperature. Once the temperature has reached 165-170F — or when the mix evenly coats the back of a spoon — remove from heat and add the lime juice and vanilla. Whisk them in completely and move to a new container to cool. 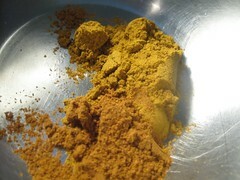 The mix can be placed in the freezer for 2 to 3 hours or, preferably, into the refrigerator overnight. 5. Churn according to your ice cream maker’s instructions. 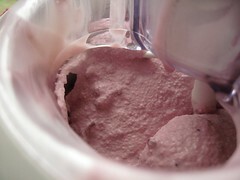 After churning, place in freezer to firm up. 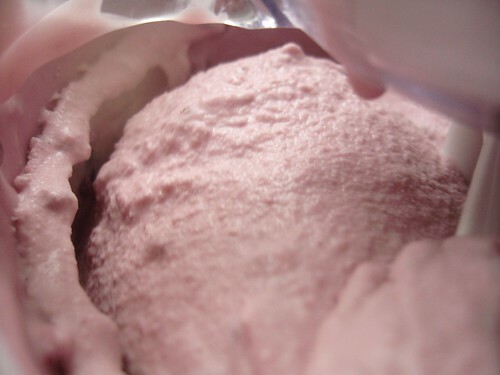 I recommend placing a seal of plastic wrap tight against the ice cream after making it to prevent a skin from forming on the ice cream’s surface. Serve once firm enough. Enjoy! Sort of… Ever been curious about us? Apparently the folks over at Culinate were as well. Not long ago, Liz Crain, their intrepid blog watcher, wanted to know more about us. So we did our first ever interview. If you’d like to plumb our depths or discover our secrets, then you can visit Culinate’s great site you and find the interview here. And, yes, he is. The little guy sleeps well enough during the night, but is quite alive and awake during the day. As a result, my wife and I have developed strong calf and thigh muscles because his favorite way to be soothed is to be held while his parents do deep-knee bends (reminiscent of the Oompa-Loompas in Willy Wonka and the Chocolate Factory). The result is tired parents and recipes that sit in the queue. In reality, though, we haven’t slowed down. I’ve still been busy putting together ideas, and we’ve been snapping photos and debating the recipes privately. Cooking is still the rage in our kitchen. In fact, we’ve had so many guests over the past nine weeks, I’ve likely cooked more and for larger groups than at any time since we started the blog. The result has been some creative things we hope to share more over the coming months. The idea that I’ve been most excited about lately is pickling, and I wanted to invite you folks into the test kitchen. With summer just around the corner and gardens starting to yield many a delicious thing, I know many of you have some ideas about the subject and would love to exchange insights. 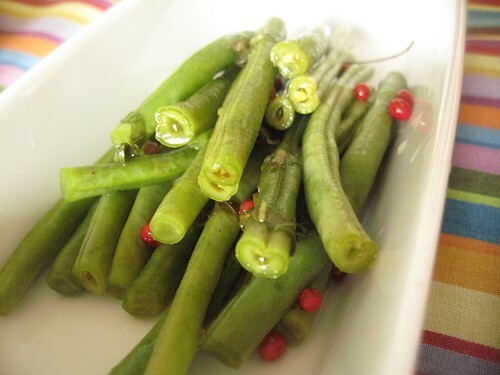 Here is what I’m working on… The first is a pickled green been with pink peppercorns and curry powder. The result has been described as having an Old Bay flavor by one of our blogger friends, Synaesthesia, when she came for dinner last week. 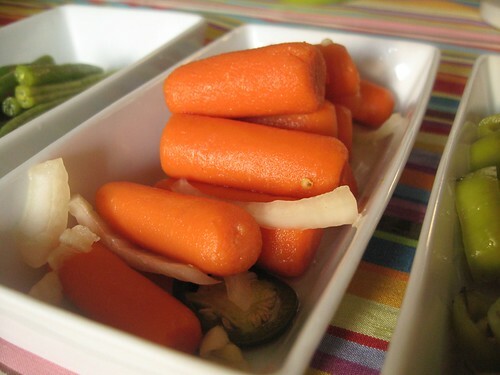 The second is a spicy carrot, a variation on the Firecracker recipe from Good Eats. The carrots have lots of straight heat and not much else. 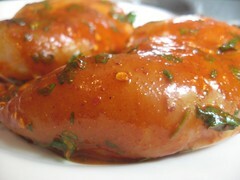 The third is pickled Hungarian wax pepper. 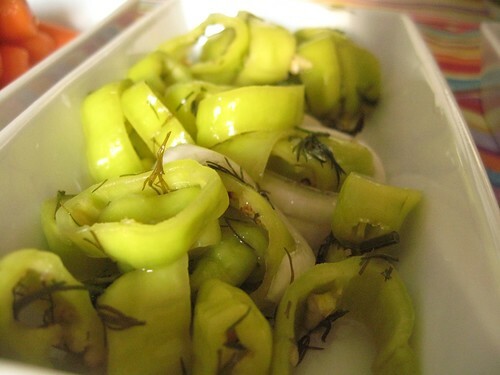 It mellows in a sweet brine of cider vinegar and dill, and has a sweet and spicy bite. 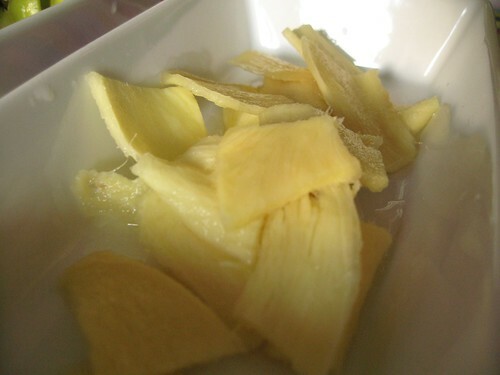 The final experiment is a Japanese-style pickled ginger, a.k.a gari. When it came time to serve them, they had not pickled long enough to produce that pretty pink color you see in gari next to your sushi, but the basic flavors were there. So this is my latest obsession, I’ll be working on these a bit longer, as well as a few other experiments, and sometime this summer I hope start posting about my pickled masterpieces. However, if you’ve got ideas, suggestions, recipes, horror stories, we’d love to hear them. So post about pickling please! It doesn’t help that it’s sometimes true. Take this curry, for example. I had become accustomed to working all day and coming home to find my house filled with the pleasant aromas of the dinner I was about to throw down my gullet. And, as if by magic, by the time I had settled in, said meal was sitting on the table, ready to eat. Not anymore. Now that I am enjoying my maternity leave and caring for my son at home, I find that I am tortured by the process of my husband preparing dinner. Especially this curry. Instead of tucking into meals mere moments after walking in and being seduced by their aromas, I am now made to wait — impatiently — as the dish is built and lovingly prepared. Oh, the smells. Oh, the torture. This meal includes a spate of marinating (which, thankfully doesn’t give off tempting odors), then grilling (which does), then roasting spices (which really, really does), and then building a gravy (yes, even more smells). By the time this curry is ready to serve, yours truly is truly frantic. So, the only disadvantage to this dish is that when it’s ready, you — and any guests subjected to its preparation — may be too tempted to woof it down in ravenous delight, rather than savoring its subtle flavors. Unfortunately, I myself find this to be true. That’s why I always determine to have two helpings: One to eat, and one to enjoy. I suggest you do the same. 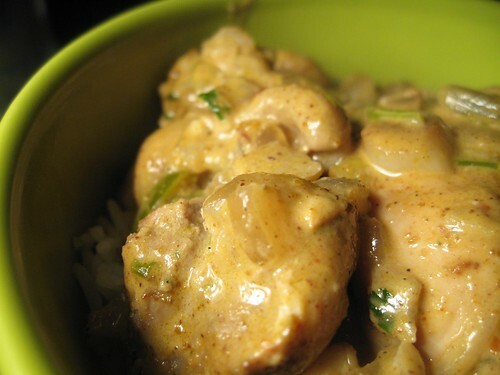 Click here to download the recipe for Chicken Curry. Another clear sign of an obsession: I wake up in the middle of the night craving good Indian food. To give you an idea how bad it is, this is the second version of this recipe we’ve posted. 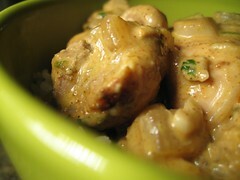 We did the earlier post, “Chicken Curry and Mind Control” on the same topic. Yet, I wanted to keep working on it. Furthermore, I have a very small cookbook collection, 15 or so books. Of those, there are two books that deal just with Indian food. I’ve purused these books with a religious zealotry, only to discover that there is something lost between those pages and my results. Indeed, I’ve been compelled to look through the recipes of other Indian cookbooks trying to divine some secret I’ve missed. In essence, I want culinary satisfaction now. I don’t want discussion about the things I missed, spices I don’t have, or rationalities in the cuisine. I want amazing curry. End of discussion. The first breakthrough came last fall when we went to California to visit my wife’s paternal grandparents. They are fascinating people who love to eat. So when her grandfather offered to teach me his curry recipe, I was more than happy to learn. His recipe is actually a Malaysian-style curry, which he learned after he and his wife fled China during the Cultural Revolution. 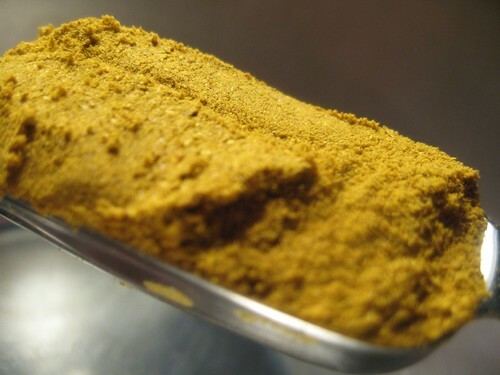 Focusing on coconut milk and good curry powder, the recipe is amazingly good and it’s reflected primarily in the earlier post. And yet… there was something missing. The flavor was not developed the way I wanted. There was a lack of depth. There wasn’t that wake-you-up-in-the-middle-of-the-night-to-start-cooking feeling that I wanted in my recipe. The next breakthrough came not long after Jack was born. Both my wife and I were craving Indian food, but commiserating that there was no place nearby with great takeout. I drove out of my way to try a new place rumored to be good, but during the long car ride it clicked — the tandoor. 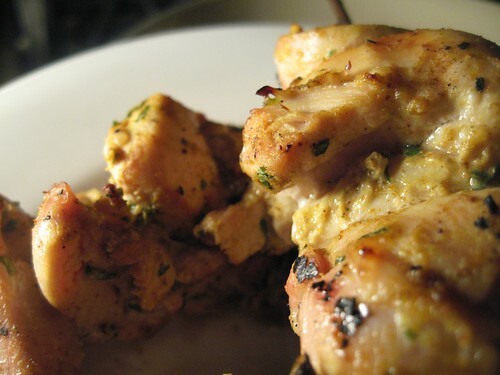 For those who don’t know, a tandoor is a round oven in which food is cooked over charcoal and intense heat. 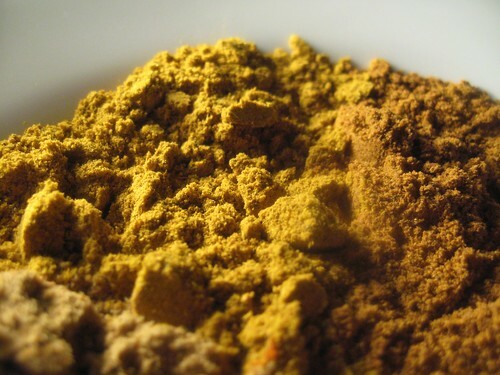 The result gives Indian cuisine a signature flavor. I don’t have a tandoor (though you can add it to my list of things I want for my next kitchen), but I do have something that has intense heat — my grill. This insight has changed everything. 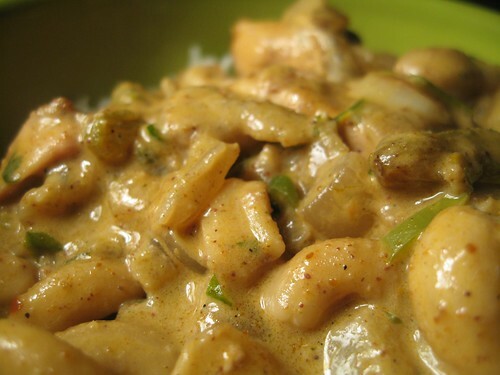 I started to realize that many dishes in Indian restaurants are not the one-pot cooking I presented in a previous post, but are two separate dishes — a protein and a gravy. They require separate construction and then unification. Since changing my mindset, there has been a startling improvement. First, I focused on making the chicken delicious. And it is. The chicken is so good that I have a tough time not eating it before I’ve added to the gravy. 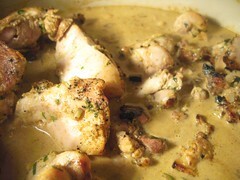 Speaking of the gravy: It’s full of flavor and the complexity that I find so wonderful about curry. 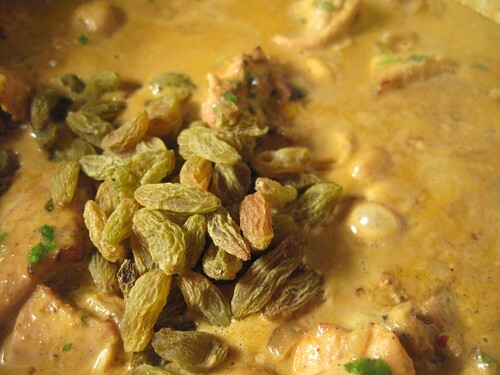 I also added new elements — cashews and golden raisins — to enhance the tropical flavors of the coconut milk. When these flavors blend, I feel they unite to become one of the most pleasing dishes I’ve posted here on the blog. Unfortunately, this new approach means a serious stretching of the prep time. But, I want satisfaction, and sometimes I’m willing to go to the extra mile for it. The recipe has lots of ingredients, lots of steps, but it is so fundamentally satisfying that I have a tough time complaining while I’m cooking. Finally, some notes on the recipe. I used chicken thighs. I prefer them because you can cook the heck out of them with little damage and I feel they have more flavor. If you have only breast meat, feel free to substitute. I would recommend Greek yogurt if you can get it. 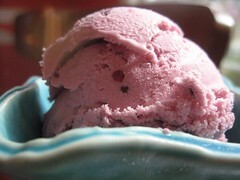 I think tangier yogurts, such as Greek yogurt, add more zing to the recipe versus the common stuff. I use serrano peppers because I like their flavor better for this sort of dish, but feel free to substitute jalapeños if you can’t find them. Lastly, I tend to use a white wine that has more of a fruity flavor profile. I think it adds another depth that enhances the sweetness in the coconut milk. 1. 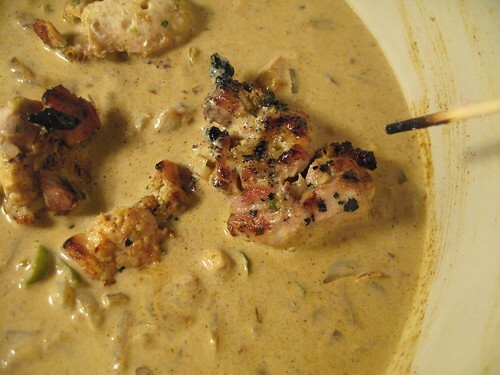 In a large bowl, whisk together the ingredients for the yogurt marinade. Cut the thigh pieces into three to four larger than bite-sized pieces. 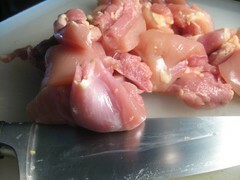 Add the chicken to the bowl and stir until all pieces are covered in the marinade. Cover with plastic wrap and refrigerate for at least one hour to overnight. At this point, I place my bamboo skewers in water to soak to prevent burning on the grill later. 2. Light the grill and heat to medium high, if gas-powered. 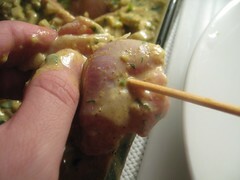 Remove the chicken from the bowl and skewer. 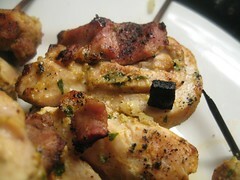 Oil the grates with vegetable oil or oil spray and then add the chicken to the grill. Cook for about 5 minutes and then flip and cook for an additional 5 minutes. Remove from the grill and let rest while preparing the gravy. 3. 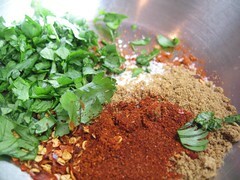 Mix together the spice mix in a small dish. 4. In a large pot over medium high heat, add the butter and let it froth and bubble. Once it has stopped, add the olive oil and let heat for about 30 seconds. Add the spice mix and stir for 30 seconds. Turn down the heat to medium. Add the onions and ginger and then salt liberally. 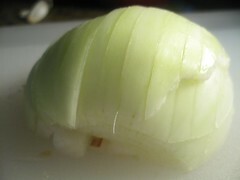 Cook for about 6 minutes stir or until the onions begin to soften. Add the cashews, peppers and garlic and cook for another 6 minutes. 5. Time to build up the gravy. Add the wine and stir, clearing the bottom of the pan of any baked-on bits (a.k.a. fond). Continue to cook for 4 minutes or until the wine has mostly reduced. Add the coconut milk and bring to a simmer. Add the chicken, raisins and cilantro and cover. At this point, I typically start my rice and let it cook while I let the dish finish off simmering together. Otherwise, cover and cook for about 15 minutes. Serve hot over rice. Enjoy. You might think, then, that I would discourage firing up the barbie for an item like chicken quesadillas, which can be safely made indoors and without the risk of sirens. Well, think again. 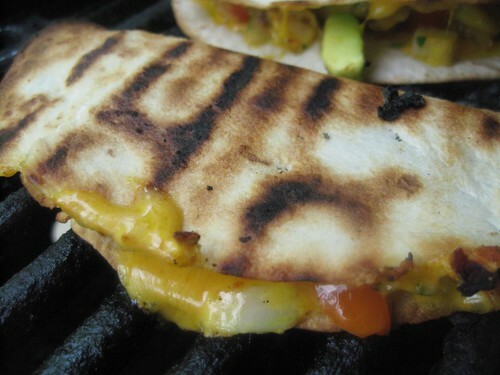 These quesadillas rock because of the sooty flames licking their crisp skins. 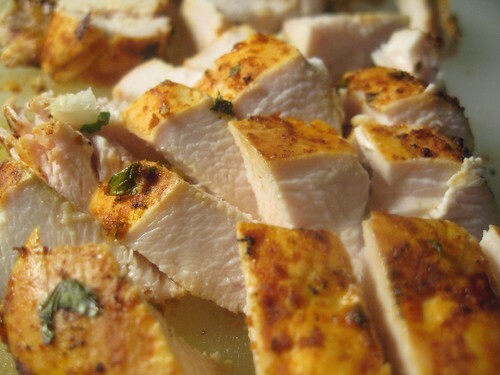 They rock because of the sear marks on the juicy chicken inside. They rock because they are crunchy and fresh and… well, grilled. As you know, I am a huge fan of eating and of my husband’s cooking. Plus, I love any items that are chock-full of fresh ingredients — here, it’s salsa and avocado. (Yes, please!) 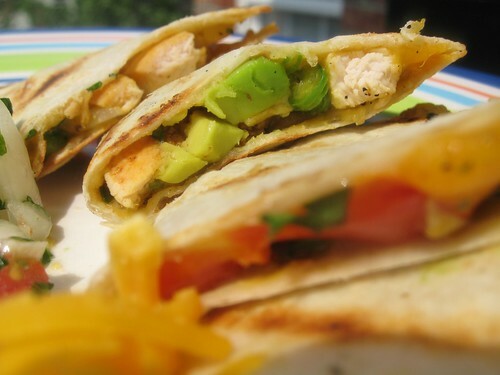 Therefore, I yield to the siren song of these delicious chicken quesadillas and throw caution to the wind. 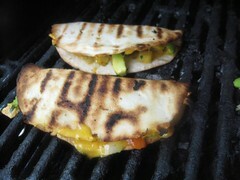 When the husband volunteers to make these chicken quesadillas, I turn on the grill. 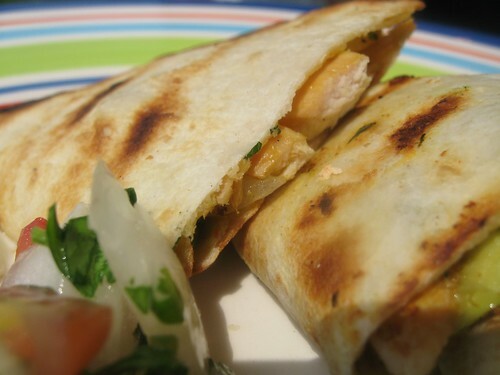 Click here to download the recipe for Chicken Quesadillas. Now that I’ve convinced you to make yourself a quesadilla, here are the keys to it. First, keep everything fresh. I know the temptation in life is to take that jar of salsa from New York City and mix it in, but it’s not worth it. Everything is coming into season now and you’ll be able to taste it in every bite. Second, the wet rub is king in this recipe. In the last post I talked about a dry rub on the ribs. (I love dry rubs, too.) But this is a dish you want to turn out on the fly, like when you are exhausted by a 2-month-old and don’t want to order out for the third night in a row. So the wet rub — here very spicy — gives you a lot of kick, without taking hours to create flavors. Finally, the grill is magic. Even my gas-powered grill can make all the difference in flavors. You can toast the quesadillas or broil them for likely the same level of doneness, but the grill marks and flavors brought on by sitting on those grates will make you crave this dish. If you can, grill. You will be rewarded. 1. This recipe uses direct heat while cooking over a grill. If using a gas grill, set to medium high heat. If using charcoal, over the coals will work. 2. In a large bowl, whisk together the ingredients for the wet rub. Pat dry the chicken breasts and dredge them through the rub. Both sides should be well coated. 3. 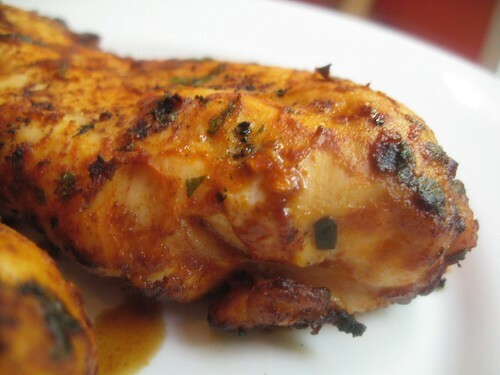 Place the chicken on the grill and cook for 4 to 5 min per side with the grill lid on or until the internal temperature of the chicken reaches 165-170F. 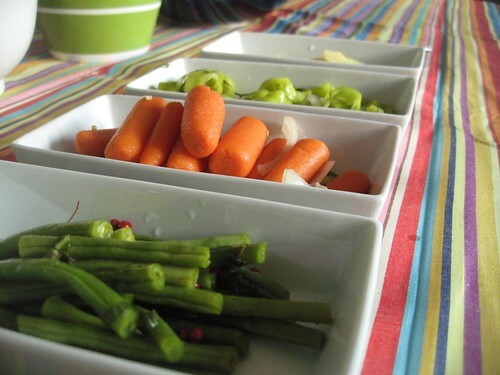 Remove from the heat and let rest for at least 5 min, preferably longer. 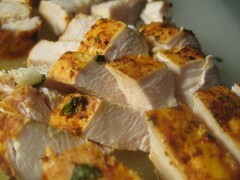 Once cooled, cut the breasts into half-inch or smaller cubes. Do not turn off the grill or snuff the flames once cooking is complete. You will be returning to the grill later. 4. 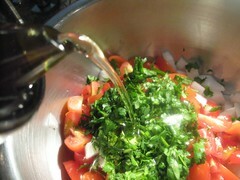 While the chicken is grilling, mix together the salsa in a large bowl. 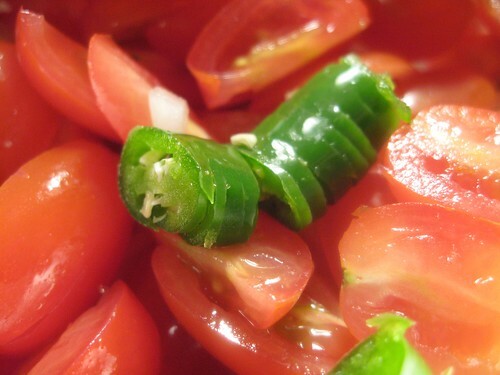 Be careful with the jalapenos — if you are not inclined to spicy food, modify. Take a third of the salsa and set aside to serve along with the finished product. 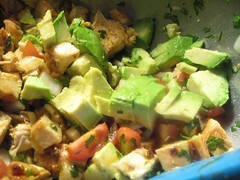 Add the diced avocado and cubed chicken to the remaining two-thirds of the salsa. At this point, if you are preparing for a party, you can stop. Simply cover tightly with plastic wrap and refrigerate. It’s important that you press the plastic wrap down against the mix, to prevent the avocado from oxidizing and turning brown, as apples do. 6. 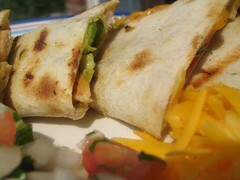 If your tortillas are refrigerated, remove from fridge and allow to warm to room temperature or until easily pliable. 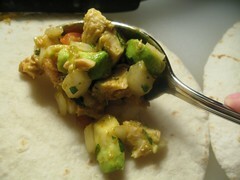 Once ready, take about two tablespoons of your chicken mix, and place it on one side of the tortilla. Add a healthy pinch of cheese and then fold the tortilla over in half. If necessary, press along the seam to keep the tortilla closed. 7. Time for the finishing touches. Place the filled tortillas on the grill. Toast them on both sides for about 2 min per side or until the tortilla becomes crisp and the edges begin to darken. 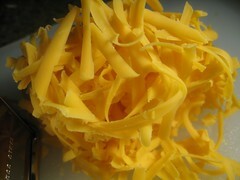 Once cooked, remove from heat and let rest for at 2 minutes to allow the cheese to solidify slightly. 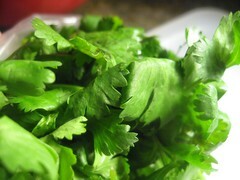 Slice in half and serve with the remaining salsa, plus other condiments of choice such as guacamole and sour cream. 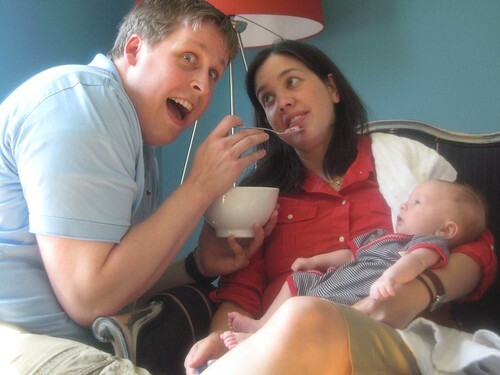 You are currently browsing the My husband cooks blog archives for May, 2007.